There are lots of different ways to get support for IDX Broker. This Knowledgebase that you’ve found is only one of many resources available to you. The URL to bookmark is support.idxbroker.com. Here you can search our help system by typing your question in the search box provided, or check the menu below to browse articles by category. Inline help is available throughout the IDX Broker interface. This is noted by a question mark icon beside a field. When you hover over this help icon, tips and information appear in a popup. Click the icon to open the topic across the bottom of the page. Click the topic title to view extended notes, links to related topics and the IDX Knowledgebase. If you can't find what you need in the Knowledgebase or need to alert us to a potential issue, send us an email at help@idxbroker.com. There is no charge associated with submitting a ticket or emailing IDX Broker. Regular support hours are Monday through Friday 6 am to 5 pm PST/PDT (excluding holidays). Free support includes answering questions not covered by our Knowledgebase, reporting of potential application or data errors, and limited guidance through any of the features available on your account. Longer calls that cover material already documented in our Knowledgebase may be charged at our hourly rate. If you have signed up for service through one of our developer partners, please direct any questions or issues to them as they are better equipped to change the settings on your account and website. 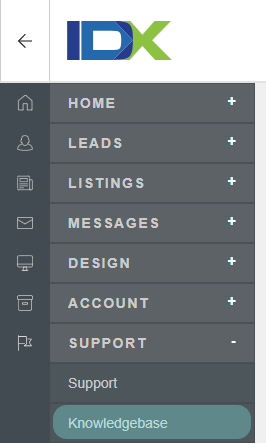 Contact your development partner quickly with the button inside your IDX account, as shown here.